On Sunday, 31st May – shortly after 3pm – a red-faced, battle-worn and drenched Paul Cicchelli finally got to sit down knowing that he’d just taken the weekend’s big trophy by turning over Formby’s Jack Dempsey in the ‘Senior Singles’ final (11-13, 11-7, 11-3, 11-6). 1) The Lancashire Closed Championships. How do they compare with other championships you’ve played in? A good calibre of player today? From a county perspective Jim Bolton and Dave Wheeldon did a fantastic job running this event. Remember that this event was only put into people’s diaries in late March and the demand to play was so great they even had a reserve list of players queuing to play in the competition. Graham Coupe always makes everybody feel welcome at his club and even posted pictures of all the players on his Facebook page. I hope that they keep running this tournament for many years to come. My little boy Franco has just turned 1 and he has tremendous hand-eye co-ordination, already able to catch a ball, so who knows maybe he can follow in his dad’s footsteps one year. 2) What I find interesting is the commitment players put in behind the scenes i.e. trying to play whilst still earning money. Of the semi-finalists today (Charles Musa, Thomas Haddley, Jack Dempsey and yourself) apparently Musa does shift work, Haddley is an electrician and Dempsey goes to college (4 or 5 hours practice a day they say). How does this impact a player’s performance do you think? It’s a valid question. I definitely look at table tennis as a hobby and my release from a stressful targets-lead job so it doesn’t mean as much to me if I lose a game anymore. I work for a telecoms company as an Account Manager looking after 78% of all the NHS Trusts with really clever systems built around speech recognition and contact centre management. I travel about 30,000 miles a year, so really fit in a game of table tennis whenever I can. In the Liverpool League I play for Crosby High School and they tend to give me notice about all the best games that they want me to play in. 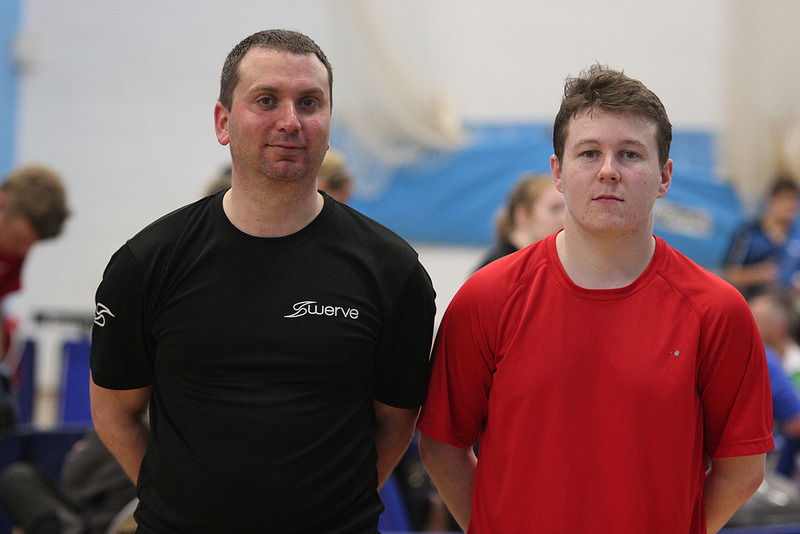 Dave Graham (Crosby High Head Coach and Team Manager) does a really difficult job in managing multiple players across multiple teams and many of them travel just as much as I do to play a game of table tennis. I’d much rather travel and play the best players after my meetings than just turn up against the weaker teams to massage my ego and win percentage rate. 3) I have mentioned you previously in articles: “too refined, too canny, arches his body like a yoga teacher, wolfman arms, bejesuses pass his lips, too big in the chops, like observing a craftsman in his shed, the most elegant chop in the game (like rocking a baby), Jekyll and Hide game”. Do you think much has changed in the interim? Ha-ha, that’s great. At 39 years of age and a body now ‘matured’ on motorway service station meals, I think I am the least likely yoga teacher. Do you know what, I probably cover about 6 miles running, in short sprints when I play a table tennis competition and all I can say is that if there is a ball, whether or not it is a ping pong, tennis or even football I can chase it down all day, but ask me to run 6 miles without a ball to chase and I’m more likely to stop off for a chat on the way; anything except exercise for exercise’s sake. 4) Did you think you had a chance of winning when you woke up this morning? Do you know what – my draw couldn’t have been harder. My first game after the groups was Martin Ireland who just doesn’t miss against chop and reads spin brilliantly. I lost the first game and could have gone down 2-0 if I hadn’t started attacking every loose shot and forcing Martin to play slightly tentative then I would have definitely lost that match. 3rd round was against Rob Hall, one of the most improved players in Lancashire. He’s physically very fit with an excellent technique and although I won 3-1 (I think) every rally lasted at least 12 shots each, which doesn’t sound a lot, but if you saw how hard he hit the ball and the angles he was finding I certainly put some effort in to win that match. The semi-final was against the best player in the room, no question, Thomas Haddley. We’ve played each other loads over the last year and every match goes to the deciding game. Thomas played semi-pro in Greece a few years back and when he hits the ball, you can literally feel the quality coming from him. Strangely enough even though Jack Dempsey (who I played in the final) was the highest ranked player there, I sort of look on him as a bit of a protégé. He’s started defending away from the table like me and always asks me for little tips and tricks. I am the Mr Miyagi to his Daniel-son (Karate Kid film reference) so I wasn’t nervous about playing Jack, although he has the chance to be the best defender in the country if he gets his head down over the next few years. 5) Which of the listed 40 or so players did you fear the most today? Thomas Haddley for the reasons mentioned before. Steve Scowcroft because he has just come back playing over the last 6 months after a 25 year break. When he last played a tournament he was number 8 in the country, and when you consider that this was the glory era of English Table Tennis with Des Douglas (ex-World number 6), Carl Prean (World Quarter Finalist) and Alan Cooke (recent World Veterans Champion), John Hilton (European Champion), Steve played a different level to everybody else in the room. And he’s such a down-to-earth fella, never giving it the ‘Big I am’, which is unusual in table tennis quarters. 6) You’re currently 171st in the Table Tennis England ‘Senior Men’ rankings (Dempsey 157th, Haddley 232nd and Musa 486th). What is the highest English ranking you’ve ever had? English Mens: 49. Juniors – I could beat the number 2 in the country and lose to the number 222 in the same tournament. I was a bit of a show-off back in the day and wanted to entertain more than put my head down and win without looking pretty. But I had some notable triumphs taking out Belgium’s top Junior at the English Junior Open and being one of the last English players left in the competition. The English Open was the last tournament I played as a junior and even though I had all these wins, they never produced another ranking list for that year. 7) Do you see progression for a table tennis player as league, county, British league and international or something different? Not quite sure what the question implies here, but table tennis is a minority sport. Even telling my work colleagues excitedly on my weekly catch-up conference call today that I won the Lancashire County Table Tennis Championships, got the immediate question back from my boss, “Hmm but how many people actually play table tennis in Lancashire?” It’s almost like anybody that plays table tennis feels that they must apologise for playing. The sport does have a geeky persona attached to it. You will get some players that will never want to enter a national competition and are happy to play in their local leagues, and others that are the best in their local leagues won’t want to play in other leagues, happier to be the biggest fish in their independent pond. The competition that Jim Bolton runs called the ‘Champion of Champions’ pits every Lancashire league singles competition winner against each other and has a large viewing audience and games are even taped and pushed on to YouTube. This is an excellent idea and I’d love to play in that competition, but Liverpool will never let me enter their end of year competition as with my job I can’t get enough league games in to qualify. Keep up the good work Jim, what about an invite-only competition to selected players from leagues – that could be a winning format. 8) What tips can you offer a junior? Shadow play – learn your shots in front of a mirror. The Chinese do this and have the best technique around and aren’t even allowed to play on a table until they have the right technique to play, which is probably taking the whole shadow-play thing too far. I used to walk around the house making table tennis ball noises imagining different scenarios to play against. This might have more to do with me being an only-child and entertaining myself than anything else . I would also tell juniors to practise their serves for at least an hour a week. If you can win cheap points with serves you don’t necessarily need to be on top-form that day, but if your whole game is built around finesse and fitness then a bad night’s sleep, cramped conditions or an unfamiliar table could be your downfall. 9) I noticed that Jack Dempsey’s face fell a little when he realised you’d made the final against him after knocking out Haddley in five sets. Why do you think that was? 10) To me the whole face of table tennis needs a boost, a lift, a proper grandstand audience, music and crowd attentiveness – a regional Barry Hearn if you like. How would it feel to top Prem’ players like yourself to have a crowd of 500, not just 100? As Kevin Keegan would say, “I’d love that!” One of my first jobs after leaving school was doing table tennis exhibitions at the Butlins holiday camps. The exhibition would normally be at the end of the holiday and all the guests would be there to collect their awards and have a drink before leaving the holiday camp. I remember I was at Butlins in Bognor Regis doing the exhibition at the end of their 70s music week. There were hundreds of rowdy guests dressed up like the village people, ABBA, Queen etc and the noise was deafening. I even signed bats after the event and felt like a temporary superstar. I sat in the crowd and let my opponent smash balls at me whilst I pretended to read the newspaper and swerve the ball back on to the table with sidespin from 20 or 30 feet away. Ah good timezzz. Jim Bolton, and his ‘Superstar’ tournament format, has a chance. We don’t need to play with bats made of sandpaper or change the rules. Just get some players in that will be entertaining, supply a nice room and some alcohol for the spectators and you’re on to a winning formula. 11) When you unavoidably jumped over the table tennis barrier after taking the 3rd set against Haddley and then immediately got cramp in your calf, did it cross your mind that you wouldn’t be able to continue? Er…yes. My whole hamstring went and I couldn’t bend my leg without feeling like somebody had a knife in my leg. Luckily for me there was a competitor who had just passed her physio exams and she worked miracles. It was pretty embarrassing to hit a winning shot, jump over a barrier and then crumple into a heap on the floor though. My wife says I embarrass her wherever I go, and I can now sort of see why. 12) What had you won before winning the Lancs Closed Champs? I won a few 2 star competitions as a Junior as well as county competitions in Sussex (where I am from), Cambridge, Suffolk and Kent. I played in a great competition called the British Boys Club Table Tennis Championships and won that 3 or 4 times too. But my trophy I’m most proud of is “Search for a Star” where I had to complete a series of sporting challenges, footballs through tyres, tennis, archery, table tennis, badminton and running. I won everything except the running and archery and I was a couple of years younger than most of my counterparts too. I loved showing off with a crowd in front of me. I got a swish gold trophy and a free holiday for my mum, so she was pleased too. 13) Do you think a full season with Flixton is on the cards again after Ramsbottom wiped the floor with them by 40pts (2014/15)? Yep, we’re back stronger and tougher. John Hilton is recovering from cancer and will (I’m sure of it) be back this year. We’ve also got Steve Scowcroft and Louis Rosenthal and myself back playing this upcoming season. Any team that has Mick Moir in it is going to be very strong, but Ramsbottom, we’re coming after you next season. 14) Do you think yourself, Steve Scowcroft and Louis Rosenthal would be a formidable team guaranteed the Bolton title? Yep, but Phil Bowen is also one of the most talented players around, and possibly the youngest looking 60-year-old since Benjamin Button, so don’t count him or Phil Biggs out of taking the big scalps too. 15) How does it feel entering tournaments like this? Is there a thirst, a need to still prove yourself? 16) What was your most tense moment today? 9-9 in the 5th and deciding game against Thomas Haddley. It was a long point and I chopped one off the floor and Thomas mishit it and it hit the edge of the table. Yep that was pretty tense. 17) What is the difference between the Open Singles and Grade ‘A’ Singles Banded? Open Singles, everybody can play. Banded Singles is open to everybody except the top seeded players to play in. 18) Did you hit top form today? Good points and bad about your game? Good points were mental toughness, getting myself back from seemingly difficult positions to win, which I guess is my strength. Weak points are that my backhand attack has now got my tennis technique and that doesn’t lend itself very well to table tennis. Imagine Stan Wawrinka trying to recover in under a second to a return of one of his long backhand drives – it’s not possible. I love tennis and will now play with my mate Roger throughout the summer so maybe that one backhand drive shot that I hardly ever use at table tennis should stay in the locker, for table tennis at least. 19) Do you think TT is in good health nationally and do you see us ever competing with the Chinese again? The Grand Prix circuit is really good for players that want to rise on the ranking lists, but the cost to enter is astronomical, over £60 just in entry forms and that’s before you take into account travel and possible hotel bills. And the winner may get a couple of hundred pounds or a plastic and glass trophy if they are lucky. (What Steve Scowcroft’s daughter calls a ‘Skimmer’ like a stone you throw into the sea on holiday.) The game needs better marketing, better ideas and decent prize money. The Chinese are the best in the world, but why not stop worrying about the Chinese and concentrate on English Table Tennis being the best spectacle and the best format in Europe? Premiership football proves that if you create a great competition then the world will follow, even if other countries actually have better players than us. Thanks. You’ve done an excellent job in your table tennis journalism in the past and we need more people like yourself pushing the sport and uncovering the stories. Remember table tennis is the most played individual sport in the world. We just need somebody to open it up and give a fresh outlook. If darts can pull in thousands of people spectating then there’s no reason why table tennis can’t. And I think you can see from your chat with other players, there are definitely more characters in table tennis than there are in darts. I couldn’t see Phil Taylor diving over a barrier for a winning game shot and pulling his hamstring, could you?